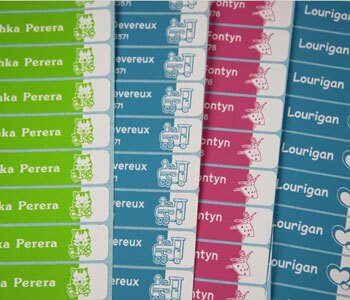 Custom printing name labels are one of our specilites. Our purpose is to provide a variety of quality labels for your family. Our products include stick-on labels, iron-on labels, shoe labels, address labels, etc. They can be stuck to the lunch boxes, uniforms, shoes and other personal belongings of your children and family, in order to make them different from others and won't be lost anymore. For more information, go to check our personalised name labels, or call our toll free number: 1800 199 168, and our courteous staff will do their best to help you.